Saville House School was housed for a number of years, in what had been the old Sherwood Hall before eventually moving to Mansfield Woodhouse in the 1960s. It was a private school and the Head Mistress seen on this photo was Mrs Doris Floyd. Known teachers were Mrs Iris Ram, Miss Gillian Charles, Miss Hardy and Barbara Smith. Top row – David Jefferies, Patricia Allen, Melanie Salter, Stephen Taylor, Ann Laughton, Robert Perry, Lorraine?, Bevery Robins, Peter Longson. Middle row - John Grainger, Andrew Hewitt, Ann Lovesy, Caroline ?, Dilys Chaplain, Susan Walker, Patricia Stokes, .?. Front row – Angela Beard, Rosemary Beard, Geoffry Bennett, Mrs D W Floyd, .?. Carol Timmons, Louise Laughton. When you went to Saville House School Bill was it in the Old Sherwood Hall or at Mansfield Woodhouse? Mrs Doris Floyd and her husband Captain Floyd lived on the top floor of the school in its current location at Mansfield Woodhouse. I was a pupil 1970 – 1976. My Mum was school nurse, Margaret Watt. 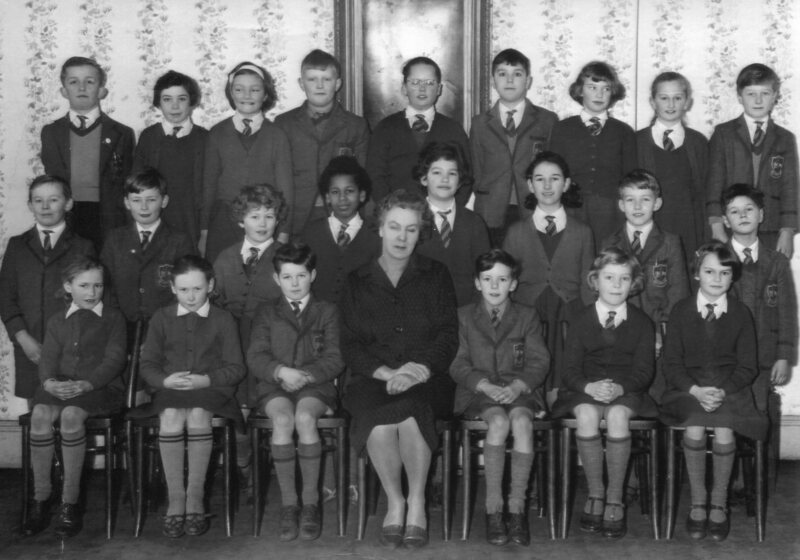 Other teachers were Mrs Janet Calow, Mrs Avril Wilkinson, Mrs Grainey – gosh testing my memory here !. Many fond memories of ballet lesson above the old stables, Ballroon dancing lessons over the road (that may have been Sherwood Hall if thats the one over the road from front entrence of Saville house )and when the Church next door got vandelised. We would get our bottles of milk delivered to the back gates every day and the milk monitors would distribute them to all students. I do know Mrs Grainey took over as Headmistress after Mrs Floyd retired.